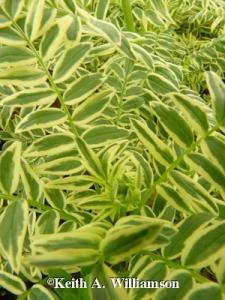 Variegated Jacob’s Ladder is December 2018 Plant of the Month – Glacier View Landscape and Design, Inc.
Variegated Jacob’s Ladder or polemonium caeruleum ‘Brise d’ Anjou’™ is the variegated form of Jacob’s ladder and will add rich creamy white tones to any shade garden. A small 12”-18” plant, it should be planted in clusters to form a thick mat. It requires regular watering and a rich loamy soil as well as protection from afternoon sun and heat. It can tolerate fairly deep shade. It produces clusters of blue to purple flowers in late spring and early summer and should be pruned back sharply after flowering to promote good foliage growth. It will stay evergreen long into our Louisville Colorado landscape fall and winter, but will eventually go dormant for winter, emerging early in spring with vigorous foliage growth. This perennial has several things going for it. Deer do not seem attracted to it, and it seems rabbits are not interested much either. It is fairly resistant to diseases, though powdery mildew and sometimes slugs can be a problem if the area is slightly too wet. This is not often a problem in Louisville Colorado landscapes. The plant only gets 18” tall or so with flowers in bloom, so it is a great option for tucking into a secluded small space. It is also tolerant all the way north or up in elevation to zone 2. Occasionally, cats are attracted to the scent of new plants, so best to keep feline friends away if possible. It is also useful for honey bee forage. Try a grouping of them in your landscape the next time you refresh your shade perennials. They will not disappoint. 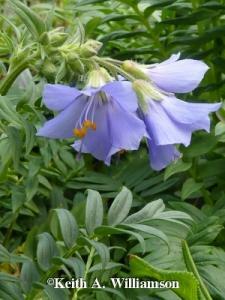 They can be found at local nurseries, or Glacier View can plant them for you.